Skip the guilt of traditional sauce-covered noodles and indulge in this plate of protein-rich comfort food. This reimagined alfredo recipe will satisfy your pasta cravings without leaving you in a food coma. Before I cared about nutrition or macros, chicken fettuccine alfredo was my go-to meal whenever I dined at an Italian restaurant. Now that the novelty has worn off, and I actually have a concept of calories, it's something I seldom order. 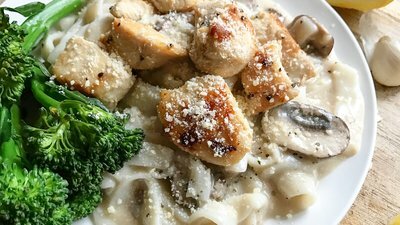 Sure, chicken fettuccine alfredo is tasty, but is it worth over 1,200 calories at Olive Garden? Hmmm, maybe not. Nowadays, I whip up this low-carb version anytime I'm craving a heaping bowl of creamy sauce, fettuccine, and tender chicken. It's fancy enough to make for a special date night, and it's delicious enough to eat all week for meal prep!